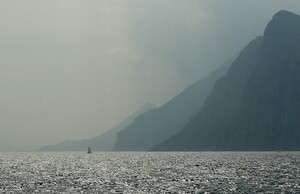 So, What Would You Like to Know About the Lake Garda Climate? The Lake Garda Climate is lovely. Balmy and Mediterranean is how I would describe the Lake Garda Weather. Often before we go, we check out the weather forecast for Lake Garda, and it usually promises beautiful days, and with the north-south breeze gently blowing throughout the day, helping to keep you cool when it gets really hot in mid summer. This wonderful Lake Garda Climate is due to the fact that the lake itself acts like a huge solar panel, and the mountains act as an insulator, keeping the heat in. OK...this is all great to know, but when would be the best time of year to go? Well, we prefer going in May or June, or September, but you can decide for yourself once you find out in detail all you need to know about the Lake Garda climate. Find out in this section about daily sunshine hours, monthly air temp, and rainfall (yes...it does rain there sometimes!). We'll also tell you the pros and cons of going during the summer and during the winter. Oh, and if you're into surfing, you'll have to take a look and find out what to expect when it comes to the winds at Lake Garda. So...Are You Ready for the Lake Garda Climate to be revealed? No matter what time of year we've been to Lake Garda, we always get sunshine most of the time! From April, you can enjoy an average of six hours of sunshine a day! And if you really want a deep tan, then go in July and have an average of ten hours a day! See our detailed Lake Garda climate chart for the daily sunshine hours you can expect for each month. Now, keep in mind that the waters of Lake Garda come from melting snow and ice from the mountains, so the water can be quite cold during the winter and spring months. It starts to warm up in May though, enough to enjoy a swim. By July and August it's really pleasant to be in...and by the way, because it's from the mountains, the Lake is very clear and clean. Depending on where you are on the lake, the water temperature can vary a little: The shallower and more sheltered areas in the south are warmer, adding to the Mediterranean atmosphere. To find out about how deep the water is here go to our water depth map. Go to the weather chart if you want to check out the average water temperatures. The Lake Garda area tends to get the most rain in the early spring and late autumn, which is why the vegetation is so lush there! During the summer, it's usually pretty dry...the driest months being July and August. Our Lake Garda climate chart has all the rainfall details for each month, so take a look and be prepared for the Lake Garda climate! This is for all you windsurfers out there! The wind is the best on the North part of the Lake, and it's very dependable making it ideal for windsurfing. The wind from the North, referred to as Peler or Vento, flows through the valley in the early morning. It usually lasts until about 9am - losing it's strength as the sun heats up the mountains - so you need to get up early for it. The wind from the South, or the Ora, develops at noon or early afternoon and lasts until around 6PM. It's not quite as strong as the Peler, but lasts for a bit longer. Want to know where to catch the best winds? Malcesine is the best surfing area for the early Peler wind from the North, and Torbole / Riva is best if you want to catch the afternoon Ora wind from the South. Make sure you check out our Lake Garda wind maps to get average wind speeds too. Should you go in Summer or Winter? Here are some Pros and Cons of each that you need to know when it comes to the Lake Garda climate. During the Low season, you can get cheaper accommodation! Some places are Closed during the Low season. You can't eat Ice Cream and people-watch out on the promenades (my favorite thing to do! )...at least I wouldn't want to during the winter! Being the most popular time of year to go, everything is Open. You can enjoy eating Ice Cream and people-watching out on the Promenades! If your Hotel or Villa doesn't have air conditioning, then you really suffer during the night!